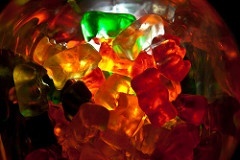 What can gummi bears tell us about measurement system analysis? We're still practicing statistics with gummi bears, because they don't bounce or slide off of popsicle sticks. In my last post, we looked at some factors that might affect how far a gummi bear flies off of a popsicle stick catapult. Next, what we'd really like to do is to pick some factors to study and do a designed experiment to determine their effect on how far a gummi bear flies, but that's not what we're going to do first. First, we're going to see how well we can measure how far a gummi bear flies. Why do we need to assess our measurement system before we get to our designed experiment? Simple: If we know we can trust our measurements, then we can trust the data we collect for our experiment. We tend to trust the accuracy of everyday devices like rulers and tape measures, and with modern technology, that tends to work out. The ease of getting accurate measurements is part of why we're practicing with distance. But don't let that fool you into taking measurement accuracy for granted! Measuring the distance a gummi bear goes with a 6-inch ruler is harder than measuring with a 25’ tape measure. In real life, some variables are so hard to measure accurately that we have to find an alternative variable to measure. Most rulers with inches will have marks every sixteenth of an inch, but we don't casually measure so precisely. For example, once it became clear my youngest brother was the tallest brother in the family, I stopped claiming to be 5'7.5" inches and let myself be 5'7". When you practice quality improvement, you'll have to decide how precise you have to be to make good decisions. More precision is not just harder to achieve, it's harder to achieve consistently. Consistency is the third component of how well we can measure something. It's generally easy to agree on how far a gummi bear flies to the nearest inch, but increasingly difficult to describe the nearest eighth, sixteenth, or thirty-secondth. If you line up your ruler or tape measure and take a set of measurements, then walk away for a while and re-take the measurements in a different ord er, will you get the same results? If you're taking easy measurements that aren't too precise, you probably will. But when we're practicing quality improvement, we want to make sure. The traditional way to study consistency of measurements is with a Gage R&R study. The first R, repeatability, is about whether the same person gets the same measurement when they measure more than once. The second R, reproducibility, is about whether different people get the same measurement when they measure the same item. It’s not uncommon to take measurements for granted. But measurement error can have a big effect on the decisions that you make. Next time we’ll take a look at some analyses that are part of quality improvement that will let you know how well you’re measuring. Get ready for the fun, because there’s more gummi bear statistics on the way!